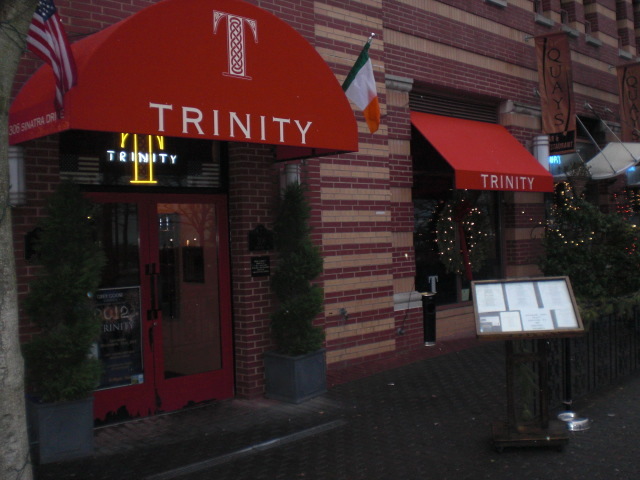 Trinity is another great eatery along the trendy Frank Sinatra Drive in Hoboken, New Jersey. Trinity opened a few years back and offers great Gaelic fare, they have a fantastic bar offering any type of drink you can imagine and such a wonderful and comfortable lounge area with Chocolate leather sofas and a back drop of the New York City Skyline right outside their windows which adds to the ambiance of your dinning experience. What makes this location so wonderful is after you are done satisfying your palette you can walk across the street, sit on a bench and admire the New York City Skyline for all it has to offer visually. Trinity does a happy hour Monday thru Friday from 4:00 to 7:00pm they also offer a late night menu Tuesday to Saturday 11:00pm t0 1:30am. This location does do a great Catering and Party Packaging business. Their outside patio in the Spring, Summer & Fall is always filled to capacity. 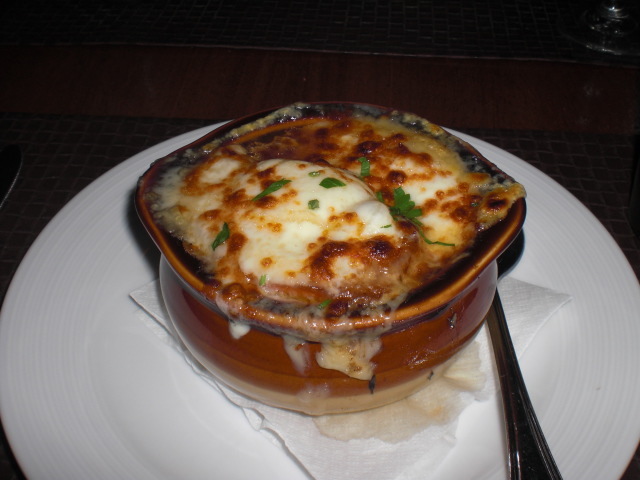 We both started with a very delicious French Onion Soup – Classic Beef and Onion Broth with Parmesan Gruyere Gratin for $8.00. 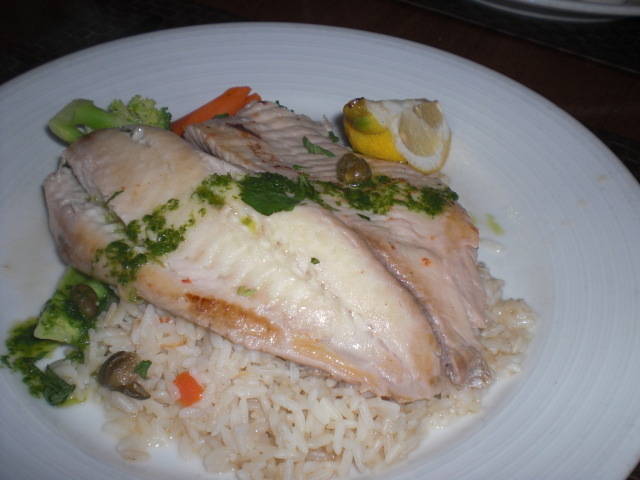 I had the Broiled Tilapia Filet – Served with White Rice, Green Beans, Lemon, Capers and Parsley for $14.00 and my dinning partner had the Blackened Mahi-Mahi – With Charred Tomatoes, French Fries and Jalapeño Tartar Sauce for $14.95. You can choose any appetizer and main course for $19.00 if you like. We finished our meal with their Dark Coffee for $2.50, my dinning partner is a connoisseur of good coffee and stated it was one of the best he has ever had. 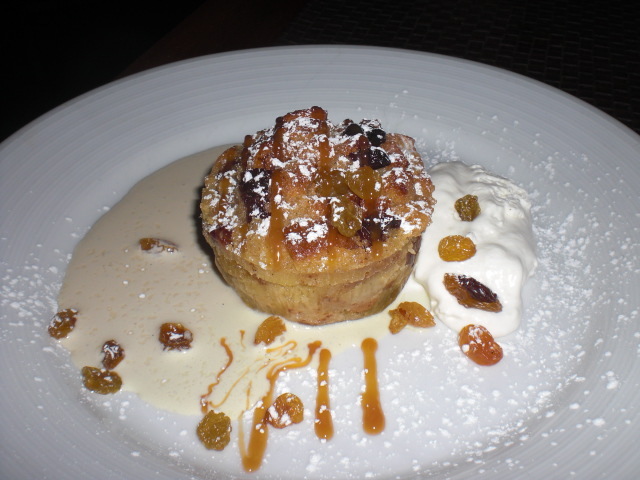 For Dessert we had the Irish Whisky Bread Pudding – With Golden Raisins, Custard and Whipped Cream for $8.00 and it was sooooooooo good. Just the right blend of sweet & decadent. 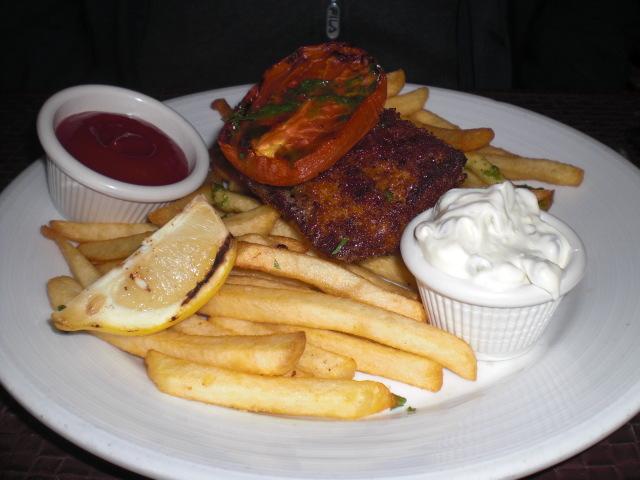 Some of their signature dishes are Steak Frites – 12 OZ NY Sirloin Strip with Steak Fries and Compound Mustard Herb Butter, Shepherd’s Pie – Ground Beef and Lamb Stew with Peas, Carrots and Whipped Potato Gratin and the Fish and Chips – Battered Cod, Steak Fries and Malt Vinegar Tartar Sauce. You can view their menu at http://www.hobokentrinity.com/menu.html.